If you’ve dipped a toe in the online dating world, you’ve undoubtedly arranged a date with someone who turned out to be pleasant, polite, and attractive, but not terribly interesting. I had a similar experience with volume one of Flying Witch, a manga that looked promising but lacked the necessary spark of weirdness or wit to make it worth a second chance. 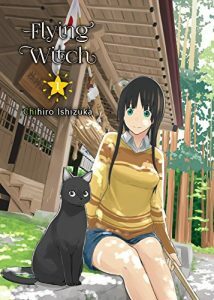 Flying Witch has a simple but fertile premise: Makoto Kowata, a teenage witch-in-training, moves from Yokohama to her cousins’ farm and enrolls in the local high school. Though Makoto’s parents warned her not to reveal her true identity to other people, Makoto blithely confesses her avocation to peers and strangers alike, almost always without prompting. That running gag is indicative of what’s good — and not so good — about Flying Witch. In the manga’s best scenes, artist Chihiro Ishizuka wryly juxtaposes the banality of the setting with the strangeness of Makoto’s witchcraft, whether Makoto is test-driving brooms at the local supermarket or pulling up a mandrake from an abandoned field. (Shakespeare was right, BTW: those suckers scream like banshees when they’re uprooted.) In these moments, Makoto’s enthusiasm overwhelms her desire to escape detection; she’s astonished that her classmate Nao recoils from the noisy, squirming mandrake, and begins regaling Nao with a list of its medicinal uses in an effort to explain why mandrakes, are in fact, awesome gifts. In other scenes, however, the punchline is toothless, coming at the end of a long monologue about witchcraft or a chance encounter with a villager who isn’t the least bit scandalized by Makoto’s true calling. Makoto’s blushing and stammering is overplayed to diminishing returns; any reasonable person would wonder why Makoto hasn’t realized that her big secret isn’t a big deal. The same is true for other recurring “jokes” about Makoto’s terrible sense of direction, which are as unfunny on the third or sixth iteration as they were on the first. The artwork, like the script, is lackluster. Though Ishizuka’s lines are clean and her layouts easy to read, the characters’ blank faces do little to sell the jokes. Chinatsu, Makoto’s ten-year-old cousin, is one of the few characters to register any emotional response to Makoto’s behavior, reacting with a mixture of saucer-eyed fear and astonished exuberance. The rest of the characters drift through the story without much purpose, functioning more like props or set decoration than actual people. Only cameo appearances by the aforementioned mandrake root and the Harbinger of Spring inject the proper note of piquant strangeness to the proceedings, reminding us that Makoto’s existence straddles the fence between the ordinary and the supernatural. I wish I liked Flying Witch more, as it has all the right ingredients to be a quirky, fun series. Alas, reading Flying Witch is like having dinner with a handsome bore who collects vintage lunch boxes or builds crystal radios; you just know there’s a good story there, but it never comes across in the telling. I watched the entire Anime I thought it was pleasant but kind of anodynei in fact the only thing I remember about it is how much 4chan “loved”Chinatsu . Kind of the same experience I had reading Aria. It’s like eating a giant bowl of whipped cream, pleasant at the time but you will completely forget about it an hour from now. That being said I did pre-order the first four available volumes and am waiting for them to come because I think it’s one of those series that reads better in large chunks. I’ve seen some of the artwork for later volumes, and it makes me wonder if those later installments are weirder or funnier. I’m taking a wait-and-see attitude about volume two! Yeah without giving too much away one story is the most Ghibli story Ghibli has never done and an interesting Hansel and Gretel joke. I tend to find stuff like this something to enjoy emotionally more than anything else, which is why I don’t review Iyashikei series that much anymore.